ORIGINAL works below, acrylic on canvas. PRINTS are derived from Jasmin's original works, offering different perspectives from their original counterpart. Selected available prints below. Printed on 310gsm paper. All editions are 1/15 with only 1-3 prints available in the US. Jasmin is based in Piha, New Zealand. A small rural beach community on the west coast of Auckland surrounded by native rain forest. She has an extensive dance background trained in Irish dancing, Contemporary dance and Ballet and has a Bachelor of performing & screen arts, majoring in contemporary dance. She performs & choreographs nationally & internationally as a freelance dance artist & dancer with New Zealand’s leading Maori contemporary dance company, Atamira Dance Company. Jasmin is passionate about indigenous dance and culture as she sees it as a way of connecting with the whenua-Land and nature. Originally from Tauranga in the Bay of Plenty,New Zealand, Jasmin studied Art locally at the Bay of Plenty polytechnic. This is where she developed her interest in acrylic painting. Over the past 10 years her paintings have been inspired by the natural world, flowing rivers, mountains and seas; feeding in and out of her dancing. Jasmin’s latest works have been influenced by her local environment along with her recent travels to New York City & Canada where she connected with the indigenous cultures of the lands. Her painting technique draws from elements of life. Earth, Water, Fire & Wind, sharing the beauty & wisdom of the natural world on canvas. Jasmin shares a world view within her painting, a spiritual interconnected weave, which unites all that exists. 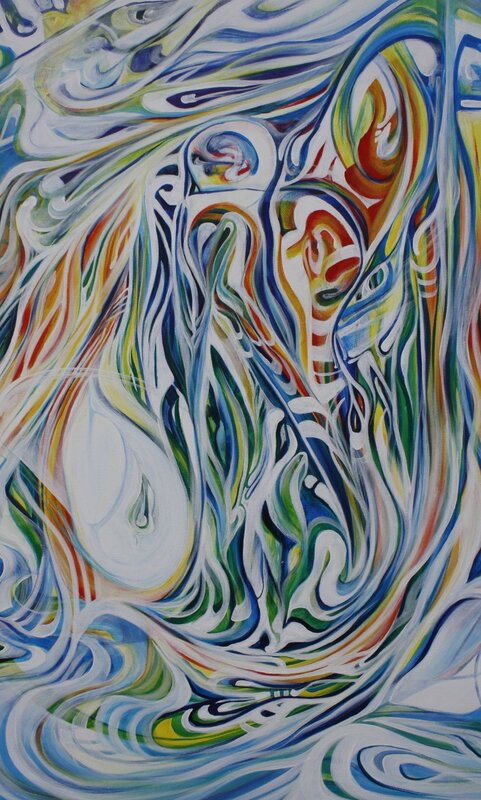 This is often illustrated in white.When painting she holds the intention of a being a vessel for the knowledge of nature, creating colors that can heal, finding images within images. An idea of life within life. The narrative of a finished work is that of the viewer’s. Jasmin wishes each person to read their own story and take what they will from her work.